Before disconnecting fuel lines or hoses, relieve pressure from the system by disabling the fuel pump, running the engine until it stalls, then and disconnecting the fuel line/quick connect fitting in the engine compartment. 3. Make sure the HDS communicates with the ECM/PCM. If it doesn't, go to the DLC circuit troubleshooting (see page 11-181). 5. Remove the fuel fill cap to relieve the pressure in the fuel tank. 7. From the INSPECTION MENU of the HDS, select Fuel Pump OFF, then start the engine, and let it idle until it stalls. NOTE: - Do not allow the engine to idle above 1,000 rpm or the ECM/PCM will continue to operate the fuel pump. - Pending or Confirmed DTC may be set during this procedure. Check for DTCs, and clear them as needed (see page 11-4). 9. Do the battery terminal disconnection procedure (see page 22-91). 10. Remove the quick-connect fitting cover (A) (see page 11-314). 11. Check the fuel quick-connect fitting for dirt, and clean it if needed. 12. Place a rag or shop towel over the quick-connect fitting (A). 13. Disconnect the quick-connect fitting (A): Hold the connector (B) with one hand, and squeeze the retainer tabs (C) with the other hand to release them from the locking tabs (D). Pull the connector off. NOTE: - Be careful not to damage the line (E) or other parts. - Do not use tools. - If the connector does not move, keep the retainer tabs pressed down, and alternately pull and push the connector until it comes off easily. - Do not remove the retainer from the line; once removed, the retainer must be replaced with a new one. 14. After disconnecting the quick-connect fitting, check it for dirt or damage (see step 5 on page 11 -315). 15. Do the battery terminal reconnection procedure (see page 22-91). 1. 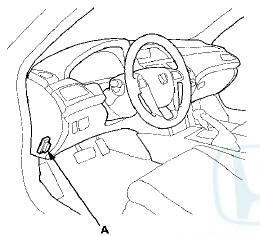 Remove the driver's dashboard lower cover (see page 20-166). 2. Remove PGM-FI main relay 2 (FUEL PUMP) (A) from the driver's under-dash fuse/relay box. 3. Start the engine, and let it idle until it stalls. 6. Do the battery terminal disconnection procedure (see page 22-91). 7. 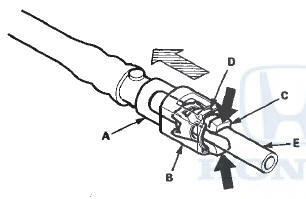 Remove the quick-connect fitting cover (A) (see page 11-314). 8. Check the fuel quick-connect fitting for dirt, and clean it if needed. 9. Place a rag or shop towel over the quick-connect fitting (A). 10. Disconnect the quick-connect fitting (A): Hold the connector (B) with one hand, and squeeze the retainer tabs (C) with the other hand to release them from the locking tabs (D). Pull the connector off. 11. After disconnecting the quick-connect fitting, check it for dirt or damage (see step 5 on page 11-315). 12. Do the battery terminal reconnection procedure (see page 22-91).